It’s time to take your training to a whole new level with double kettlebell exercises, kettlebell and suspension training combo workouts, and much, much more!! Not sure which video is right for you? Find out here. The Ultimate Body Sculpt and Conditioning Volume 1 got your heart pounding and left you completely drenched. Volume 2 fired up muscles you never knew you had and smoked your entire body from head to toe (in a good way). Now it’s time to take your training to a whole new level. By doubling up your kettlebells and adding some suspension training, you will reach a new pinnacle of power and strength. 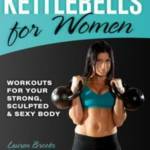 The workouts on this DVD will provide you with the necessary tools to become leaner and stronger. What do all of Lauren’s DVD’s have in common? They will all help turn you into an explosive fat burning machine and they never get old! Volume 3 Level : Intermediate/Advanced. Equipment required : 2 matching kettlebells according to your strength and conditioning level. What if I don’t have a TRX or any kind of suspension training apparatus? Will I still be able to use this DVD and/or make modifications? 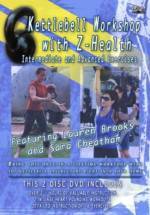 There are two workouts on this DVD that do not include any sort of suspension or TRX training. The longer workout on this DVD does include the TRX. However, you can still make modifications using your body weight, kettlebell, or even a physio ball, depending on the exercise. I can give you modifications for the exercises you need help with, if you get stuck. Just email me! I love your DVD’s, but I’m not sure if I am ready for Volume 3, since it contains Double Kettlebell exercises. Is it required to have two kettlebells? 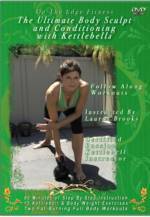 This DVD contains both Single and Double Kettlebell drills throughout. We provide modifications for most double kettlebell drills if you prefer to use just one bell. For the exercises that we do not provide modifications for on this DVD, it’s easy to just go down to one bell or use a slightly heavier bell than you are use to for most of the workout. How long are each of the workouts? What is the running time of the DVD? When was the cover picture taken? The pictures used in this DVD were all taken the day of the filming. This was filmed a month after I tore my ACL in my left knee. We don’t use photoshop or any air brushing. And yes, this was taken after I had 2 kids, which is obvious, since I have never had any cosmetic surgery. Women need to know that they can still be beautiful after having children, even if they have scars on their bodies from the pregnancies. It’s apart of life. Do you ship to the UK, Australia, Canada, or International? Yes. All of the On The Edge Fitness DVD’s are shipped everywhere and coded for ALL regions. We have shipped all over the UK, Malaysia, China, Peru, Ireland, Turkey, Greece, Denmark, Mexico, Belgium, Switzerland, France, Sweden, South Africa, Spain, Italy, and the list goes on and on. All of On The Edge Fitness DVD’s are high quality Glass Master Pressed, Coded for All Regions, and shipped all over the world. We only use high quality DVD replication and guarantee all of our products. How can I incorporate these Follow Along Workouts with your other DVD’s? Very Simple. Email me with the DVD’s or workouts that you are doing now, current level of fitness, any other activities you are involved with, and your goals, and I will send you some ideas on how to implement it safely. This goes for all of my DVD products as well. If you ever have any questions on program design with rotating my DVD’s, just email me. I answer all my emails personally and pride myself in that! Can I use Volume 3 by itself to get to my goals? Yes. In fact, I have an 8 week progression program that I will personally send to you that you can follow with this DVD.